Chosen Ohio's Best Ice Sculptor by Ohio Magazine! 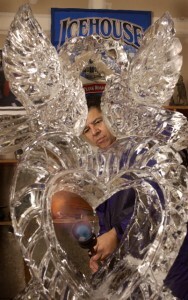 Personal: He’s operated his business, Ice Sculptures by Ramon, for 14 Years with his wife, Sharon. They’ve lived in Dayton for 17 years and have a 38-year-old-son and a 7-year-old granddaughter. The way he does it now: Rodriguez is now the only full-time ice sculptor in the Dayton area, doing up to 800 carvings a year. He works by himself, creating sculptures in his studio and freezing them until delivery time. Most blocks are 300 pounds; he used chain saws, grinders, chisels, routers and sandpaper, then smoothes with a blowtorch. He teaches his art to culinary students at Dayton’s Sinclair Community College, telling them often about his first swan-chicken. Looking forward to: An annual January meeting of top national carvers at Ashland University, where they sculpt three-ton blocks. Rodriguez goes every year.